Pomanders were used by aristocrats during the Middle Ages to protect themselves from the bad smells that they believed carried disease (particularly the plague). Medieval and Renaissance pomanders were usually made of precious metals and sometimes adorned with pearls and gems, with compartments for different fragrant herbs. Nowadays we know that illness is not spread by evil vapors, but there will always be situations in which one would be glad to covertly take a whiff of something heavenly! 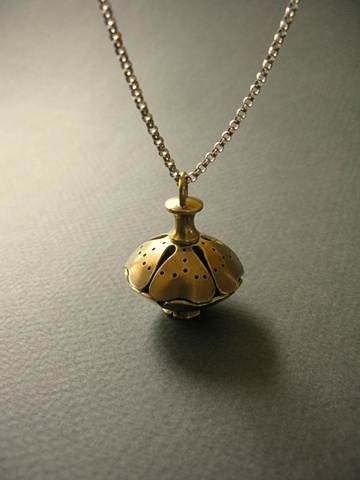 This brass pomander opens when you undo the handmade screw top. A piece of velvet is inside, which you may spray with your favorite perfume. Or put a bundle of fresh rose petals inside! The pierced pattern takes the form of a medieval rose, which symbolized health and purity and was associated with the Virgin Mary. In the more sensual tradition of courtly love, roses represented romance and female sexuality.